Don finds peace. He also finds the idea the for a new :60 Coca Cola spot that makes history. I already miss this character. 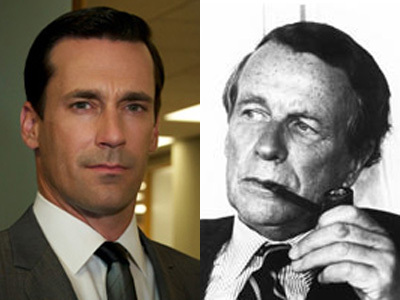 On one hand, it’s hard to sum up Mad Men the day after the series finale. On the other hand, it’s hard not to. So I’ve decided to join the fray with the other half-million reviewers / mourners. The Top 5 greatest shows recap. Funny: At least two of the above end with some version of “It’s the real thing.” Sigh. Peggy and Joan each sought career and sometimes love. Joan thought she’d landed one of each, only to end up choosing career over traditional love. Peggy got both. Funny, how when you let things go a bit, they seem to come back together. Couldn’t resist including this image of Peggy, who is right there. Don finally got clarity, however fleeting — although, it seemed long enough to crank out the legendary Coca-Cola commercial promoting world peace. What does Roger care anymore? He’s had a stellar career, so he settles into l’amour. Pete, lucky dog, gets his wife and kid back and keeps that lucrative gig with McCann. Betty – dang it – love or hate her, has a death sentence hanging over her, though I’d expect her to find her way out so as not to put her children through watching their mother die. Surprising: The show ends in hope. Hope that Don can somehow make something of the name and identity he’d assumed, and maybe even be a more present father in his children’s lives (really?). Hope that the world could be a better place (the Coke commercial). I’ve gotta say: I fully expected a European turn for the worst – someone’s tragedy, a la Downton Abbey, where someone seems to die in nearly every season finale. 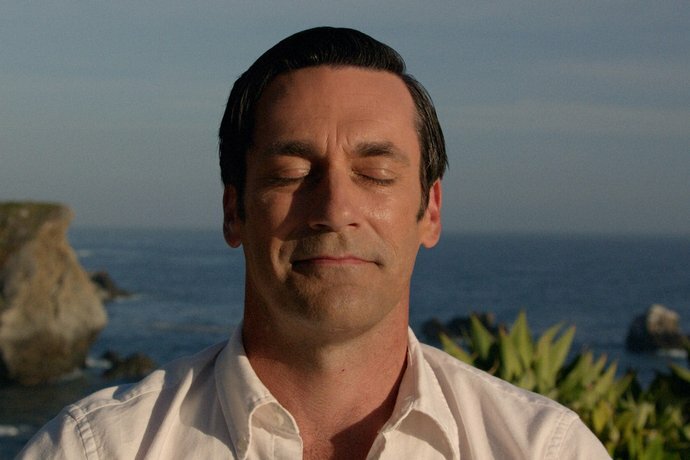 To me, the hopeful ending makes Mad Men a new, true, all-American classic. The aches of those questions and their answers were real and often frustrating during the series, which easily could have ended more tragically. But the idealist in me is glad Weiner chose hope for the final note. Still, I cannot tell a lie: I will miss seeing that Don Draper face and wanting to know the thoughts behind his dark eyes. 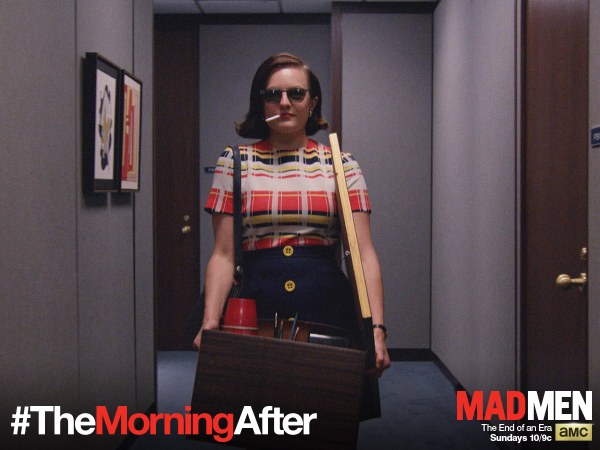 So long, Mad Men – until the next binge. A shot of my hubby on the shore, with a snowstorm threatening just beyond. So I sent the hubby off on his Annual Ice-Out Fishing Trip over a long weekend – the 19th such event. 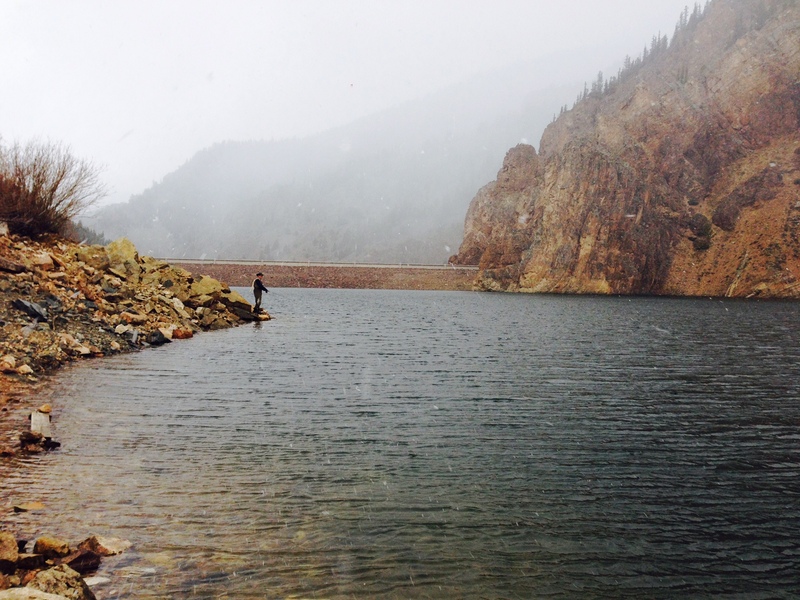 Family and friends from Texas and Colorado met in western Colorado to go on the offensive for some hungry fish. Little did they know what they’d be up against – because, logistically, something always goes wrong. I’ve concluded fishing is like any other sport. It has its own terminology and its it own breed of competition, which includes a certain brand of stories. For example, if the fish are biting in a certain area, it’s not uncommon – correction, it’s downright custom – not to tell inquirers what the fish are biting on (i.e., lure/bait). I guess it’s the accepted way of protecting the watering hole and tomorrow’s catch. On the other hand, when one has caught fish, he/she is likely to stretch both story and fish size to nearly unrealistic dimensions. Lo the angler. He riseth in the morning and upsetteth the whole household. and the truth is not in him. Last I’d checked (yesterday morning), there was a winter storm warning, with 6″-12″ of snow predicted for the area where they were fishing. The last time I heard from my hubby, the bites had been few. Note for 20th Ice Out: Don’t bother fishing in the snow. And all the fisher guys weren’t even there. 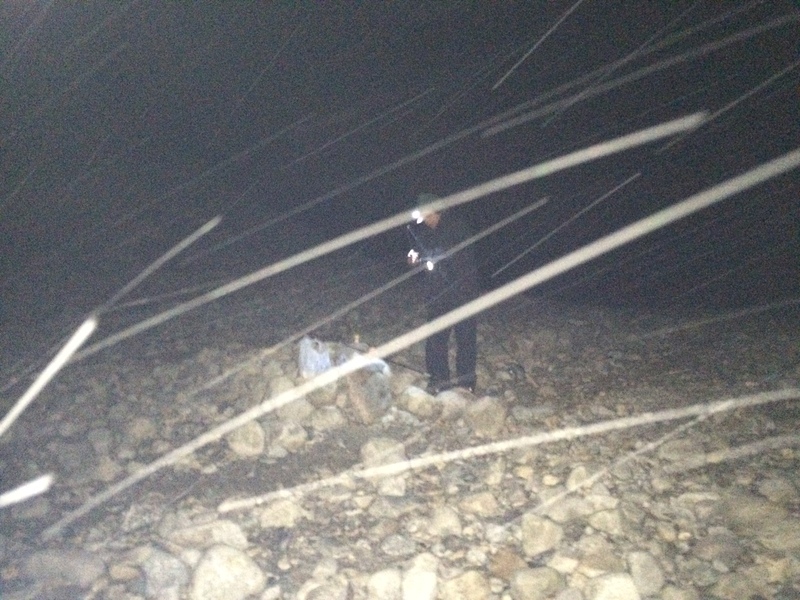 One had gotten held up behind an accident on a mountain pass, so he had to spend the night in a nearby town. This could only mean one thing: a very long weekend, to include multiple stops at various streams on their way home. While the hubs and pops-in-law unloaded the car, I asked hesitantly whether they’d caught anything. Dad mentioned they’d run into a group of fishermen at a nearby store – 23 of them – who’d just caught over 300 fish in the same area over the weekend. Naturally, I was hopeful our guys had gotten some good intel – and fish – before trip’s end. I know now it was the truth, because tonight my hubs just vacuum-packed over a dozen speckled trout – the largest at about 16″. Whew! They didn’t get skunked by a bunch of fish. So a good trip all-around. I’m just waiting for the story about “the one that got away” – as in, the 24″ kind. Next year is The Big One – the 20th Annual Ice Out. The Big Cabin is reserved, the caps and t-shirts are being brainstormed. Other than that, I haven’t a clue what that this means in fishing terms. I’m sure there will be some great stories, though. I need to do a better job of cleaning out my bookmarks. Found this under a pile of moth balls, so I had to dust it off and air it out. Copyblogger’s original post was inspired by the father of all Mad Men. No, not Don Draper (left). I’m talking about the real father of advertising, David Ogilvy — the copywriter’s copywriter and author of the creative classic, Ogilvy on Advertising. Because before social media, there was advertising. And then social media changed everything. Basically, good content is good content, regardless of its era or semantics. Call it advertising, blogging, whatever. It’s content no matter how you slice it. While advertising has long been perceived as a trendsetter in pop culture, Ogilvy viewed it as content that informs. Granted, the path to the consumer dollar today is kinder and gentler, and less linear. But the idea is the same: Make your content so useful that people want to take action. 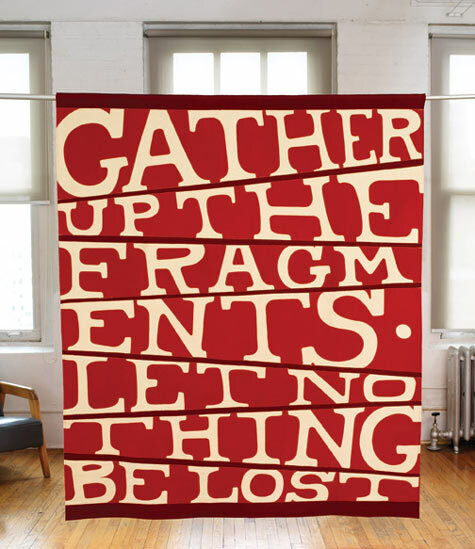 “Nothing Lost” quilt by Paul Loebach. Image Design*Sponge. In the last couple of years, I acquired a newfound love for modern quilting. While this beauty here is made of wool, its construction embodies the biblical quote (John 6:12) it comes from. In the passage, Jesus had just fed a crowd of 5,000 with two loaves of barley bread and five fishes, before asking his disciples to pick up the leftovers, so nothing would go to waste. The barley bread leftovers filled 12 more baskets. I think I could be doing this for a long time – this one family member. It’s OK though. In a month of Aha! moments, I’ll take any clarity on my ancestors I can get. And whoa is me, I’ve been running down the wrong trail for quite sometime. U-turn! 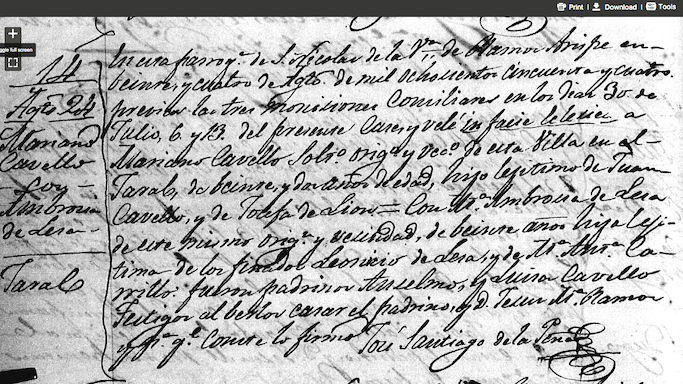 His marriage record cites a Mariano Cavello (Cabello) as his father and Ambrosia Lesa his mother. His death record, however, cites an Anastacio Cabello as his father and, again, Ambrosia Lesa as his mother. Anastacio (Anastasio), more often than not, goes down in the record books as his dad. Braulio’s birth/christening record is still AWOL, but now I’m motivated to give it another go by (re)starting with what I already “know.” Even if there’s a discrepancy around his father, it’s one I know about. This critical link, after all, means we might – juuuuust might – tie back to the founders of San Antonio. There’s lots of cool stuff in that. Maybe we also founded Mi Tierra restaurant. A girl can dream. For too long I assumed Braulio’s different father names was just a discrepancy. (What?! Silly me.) Aside from seeing the other side of my family (my mom’s side) and the drama that can happen in the name of love, I also know marriage customs then weren’t what they are now. For example, when a woman was widowed, often she would marry her brother-in-law. Not sure that’s what happened here (other way around), but now I know exactly where to go and what to do next. I am determined to find out. As if life with social media weren’t real-time enough. I never thought I’d be curious enough to jump into video, let alone real-time video. For the moment, I’m not. Not personally, anyway. Heck, I hardly take selfies, much less video of any kind. But I am fascinated by emerging technologies and their potential uses. 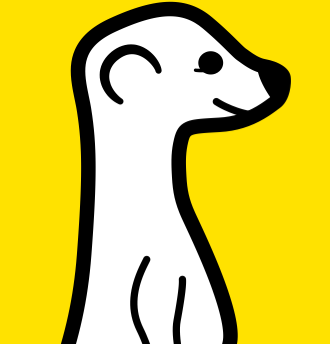 Too risky: Who’s gonna control outgoing content? Too raw: Great. Now we need another editor. Too transparent: The execs will never let us do it. And yet, just like social media, opportunities abound. If your marketing or communication needs call for the immediacy of video, it’s official: the tools are here. Oh and of course – law enforcement. Can’t forget that. The possibilities are really endless and don’t necessarily have to be invasive or high-risk, although for those of us unaccustomed to putting our entire lives out there, this can feel pretty voyeuristic. Some folks will “go there” and it will be interesting to see how responsible users will be. But I’m more excited to see how this space matures and the good things it has the potential to do. My mind’s wheels are definitely turning. Meet Esperanza*. She’s a wannabe. Well, kind of. I believe the artist actually wanted her to be like the girl in this Fernando Botero painting. 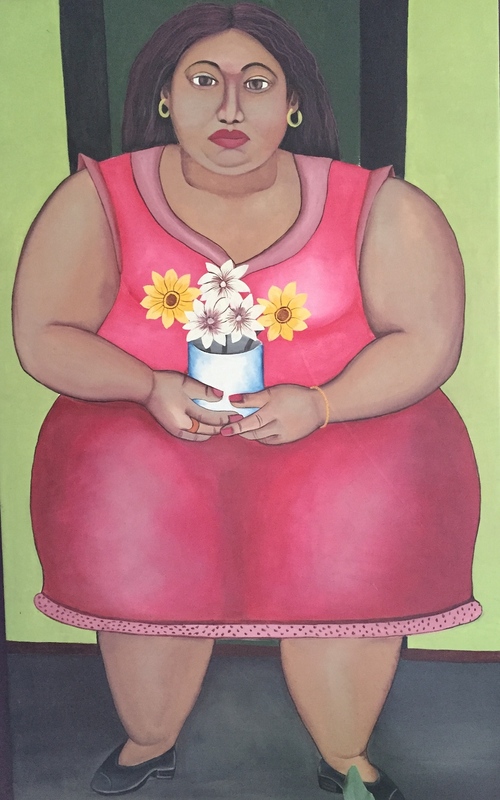 Her proportions are similar to a Botero, but Esperanza appears notably more Caribbean. Anyway, that trip was my first trip to the developing world – and, surprisingly, my only trip to Haiti (hopefully not my last). It was where I began learning from the best — like photojournalist Chuck Bigger — things like the composition of a great photo. It’s where I learned how to gather and tell an organization’s story from the point of view of its “customers” — those who benefited from its services. It’s where my eyes were opened to the many opportunities we take for granted in the United States and developed world. It’s a hard truth, but a truth nonetheless: Most of the world is not born into opportunity like Americans are. But parents everywhere still want the same for their children – to be healthy, to be loved, to belong, to have a better life than they had. I used to think that meant they thought their children weren’t “somebody” already. But I believe it’s more that the child’s potential hadn’t yet been uncovered. When it was, stories changed. Families changed. Futures changed. For some families, it may mean a child has completed primary school and can work in the local market selling goods that help the family with income (not an ideal situation but certainly a real one). Or a high school education, which may mean a more technical vocation. A university education means a young person can become “a professional,” with a sustainable income to support even an extended family, including education for siblings and others. When a child’s potential is developed, they become somebody who can bring health and hope a family hasn’t seen, lifting them out of poverty. And it doesn’t stop there. It ripples out to the community too, and sometimes even nations. That’s why I call Esperanza a wannabe. Because I believe she wants to be somebody. Maybe somebody like a Botero – only better. *Esperanza means “hope” in Spanish. This painting was named by my talented friend Kris, who kindly stretched the canvas she’s painted on. The canvas, by the way, is reused upholstery fabric.